Delta-Therm Roof and gutter de-icing cable increases heat output as temperature decreases and conversely, decreases heat output as temperature increases. It produces heat output of 6-Watt/ft. 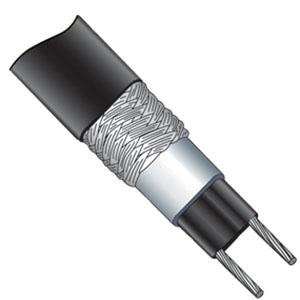 Cable has current rating of 30-Amps and voltage rating of 240-Volts. It has maximum circuit length of 335 ft. This industrial series cable has two parallel bus wires electrically connected by a web of PTC conductive polymer. This cable features thermoplastic elastomer jacket that offers greater protection against external impact. Tinned copper braid gives additional mechanical protection as well as a ground path for fault currents. Cable comes with thermoplastic or optional fluoropolymer over jacket that has UV inhibitors to protect against damage from the sun. It withstands maximum exposure temperature of up to 185 deg F. It is great for roof and gutter applications. De-icing cable is UL listed and CSA certified. * Inventory displayed is accurate as of 04/25/2019 01:40 EDT.